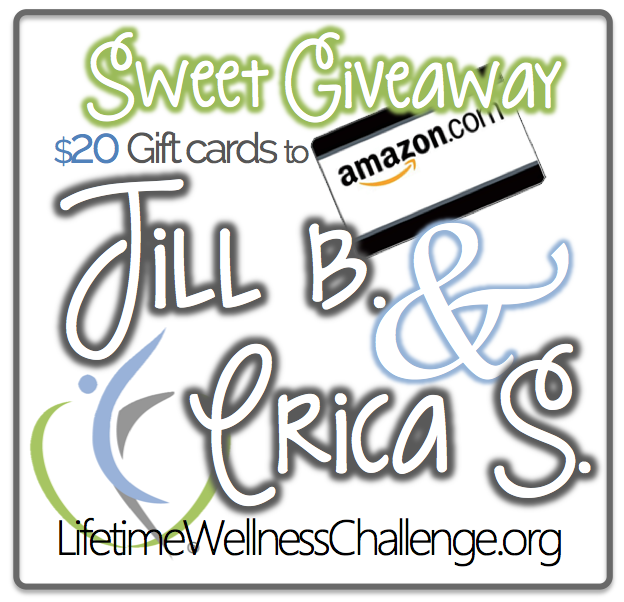 love hearing Lifetime Wellness Challenge participants grow lifestyle . If you had a great start, but your resolve is faultering, know this... it's NOT too late to finish strong, even in an EPIC way! Don't let a few small setbacks become BIG setbacks. You're more capable than you know. Keep going. Keep moving forward in this FINAL STRETCH! Complete your workbook and do all you can to finish STRONG! 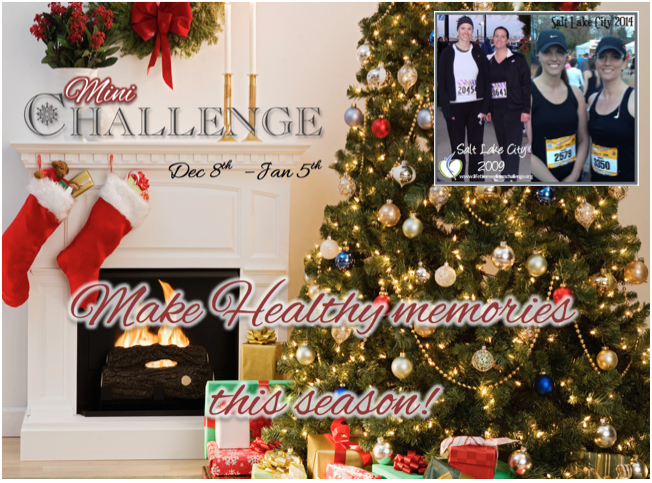 Oh, and don't forget to gather your teams for the HEALTHY HOLIDAYS CHALLENGE and sign up before you run out of time. The deadline is September 30th. 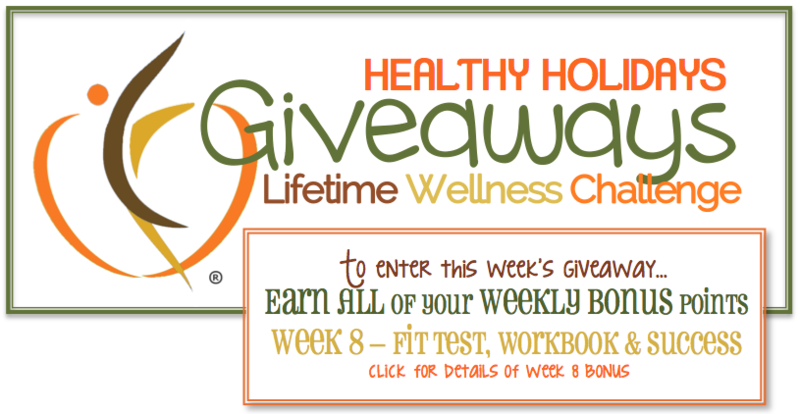 We made it through another week of making healthy habits a consistent part of life! Give yourselves a great big pat on the back for all your efforts. For those of you who participated in the Tiebreaker Bonus, we hope that you enjoyed it and that it lifted your spirits this past week. I truly believe that gratitude is the key to a content, full and happy life. So, even if you don't get "points" for doing so, I encourage you to continue looking for all the things you have to be grateful for and take a moment to express that gratitude to those who need to hear it! Many times we seem to tell ourselves that it's the BIG changes that are going to make the biggest difference in our health long-term and though that's not necessarily false, we've found that it is most often all the little things we do daily that makes the greatest impact for real, long-lasting changes to our overall health and well-being. Okay, okay.... I'll get off my stool now and announce the Week 5 Winners. Remember the days of youth when summers felt long and full of free hours to fill with whatever kind of free spirited adventures you could think up before Mom called you in when it became dark? Yes, it's a distant memory for me, too. These days it feels like summer is just as busy as the holidays can be! What happened?!? Oh, that's right adulthood. All the responsibilities of work, church, children, appointments and then add in all the planning required for summer fun activities like lake visits, hiking, racing, vacations, sports, reunions, barbecues and it can get downright hectic. You know what else can be surprisingly difficult during the summer? Earning all those sweets points each week. Let's be honest. Summer can be HARD when it comes to sweets! Maybe not as bad as say... the holidays, but pretty darn close! It seems like every activity, every barbecue, every gathering of any kind has sugary treats as the main event or at least a highlight to the shindig. I mean, really, when people think of summer, what images tend to come to mind other than sunshine and water? Ice cream and popsicles, of course!! Walking away from it all can become pretty difficult with a persistent host, but it IS possible. Something that I've found that helps me to navigate sticky situations to be vocal about my goals in casual conversation. That can make it much easier to make a good decision later when temptation is presented. These days most people can be pretty understanding and you'll find they may actually want to help you make good choices. Valerie wrote a post recently and highlighted how changing your personal dialogue from "I can't have that" to "I don't want to eat that" (or something similar) can really help overcome some of those tempting moments. If you're looking for good suggestions or a pep talk for making better choices you may find this posts helpful. Do you sometimes wonder if those “little things” you’re doing every day such as eating 5+ fruits and vegetables, getting 30+ minutes of exercise, limiting (not forbidding) sweets, reaching out to others and all those other habits you’re working to develop, really make a difference? Let me tell you, THEY DO! The BEST part of my job is getting to hear all the wonderful successes that our participants experience and seeing those "little things" in action. He isn’t alone. There are many of you striving each week to do the “little things” and those little things are adding up and will pay off in a big way as you stay consistent. 2015 Summer Shape Up: Let's Get Started! Your Goals Are Worth the Effort.. KEEP GOING! I’m so very proud of all our participants this week. I lost count of how many pushed hard to earn perfect points this week! You are all such dedicated ROCK STARS and I love it!! Before we move onto results, I would like to address a concern of mine. I saw a lot of food logs this week and among them were quite a few very low calorie logs. Now, I’m not talking about the ones where you may have fasted for religious reasons or had an “off” day, but the logs where the calories were consistently under 1200 calories and the exercise nearly equalled the amount of calories consumed. Now, there could be a few reasons for the low calorie consumption; maybe you were really striving for a big loss this week, maybe you saw someone else post a really low calorie day and thought that maybe you would look like you were eating way too much if you posted a 1400 or 1600 calorie day or GASP! an 1800 calorie day, maybe you just aren’t sure how much you should be eating so ate as little as possible. Whatever the reason, the reality is, that we all have different nutritional needs. If you are 6’ 0” and actively training for an event or working out hard you cannot eat like a 5’ 1” person doing pilates a few times a week. You have got to fuel your workouts, whatever they may be. Even if you’re not in training, not eating enough is still not eating enough and it will affect you and is most likely killing your fat loss. Check out this article. 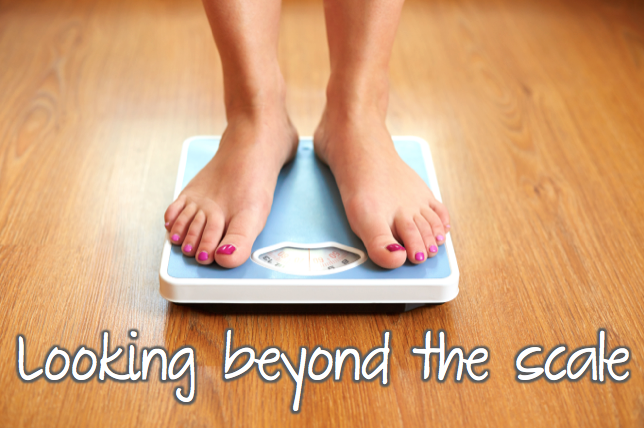 I know on the surface it seems backwards to say that eating a little more might help you lose weight but it can be true! I remember a few years ago when my sister called me frustrated that her weight loss had stalled. She said, “I don’t understand! I’m exercising like crazy and I hardly eat anything and the darn scale won’t budge! What am I doing wrong?! ?” I asked what her intake was and she was trying to fuel 2 hour workouts on around 1200 calories a day! I told her, “You have to EAT! !” She reluctanly bumped her calories back up to 1400-1500 and she found she was losing weight again within a couple of weeks. This is not a lone example. We’ve worked with more participants who have put themselves in similar situations and were amazed at how eating a little more actually helped their metabolism kick back into gear. 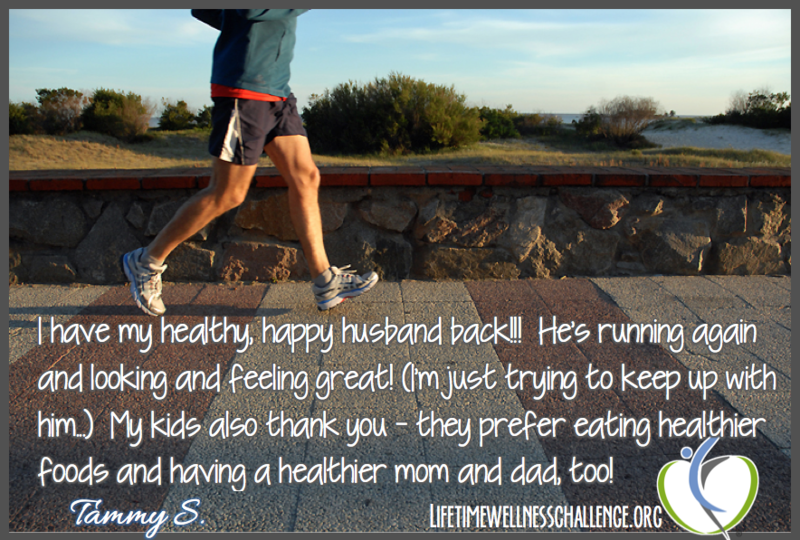 Steve S is Running Again and Feeling Great with LWC Healthy Habits! As I went through some of the comments and success stories this weekend, there were a few I just HAD to share with you! These are from a couple of gals who have been with us on and off the last couple of years. Valerie and I, though we've met few of you in person, we feel a connection to you and truly do cheer for your success. Your names and little profile pictures are recognized and your stories inpsire us. We hope that these will inspire all of you as well. 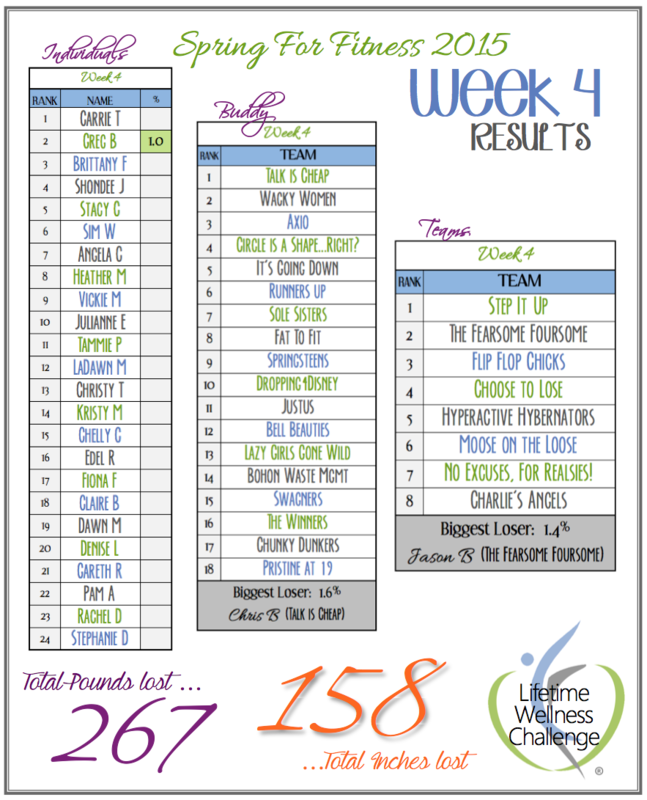 The New Year, New You Challenge participants had another week of success. 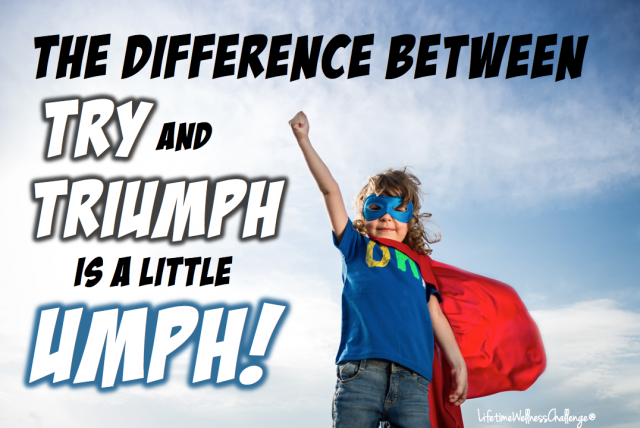 Whether the success was weight loss (a few had some SERIOUS losses this week), being able to maintain a goal weight for another week (this can really be hard sometimes) or the ability to overcome the difficulties of a challenging week and continue to keep their health a priority, we saw success! We also had a first at LWC this week. We saw a three-way tie for the biggest loser this week in the Team competition. Andrew S, Angela A and Wayne W all had a weight loss percentage of 1.6%! Kristy M from the Individual competition was just behind that with 1.4% and we were amazed with Susanne H.’s loss of 2.4%. 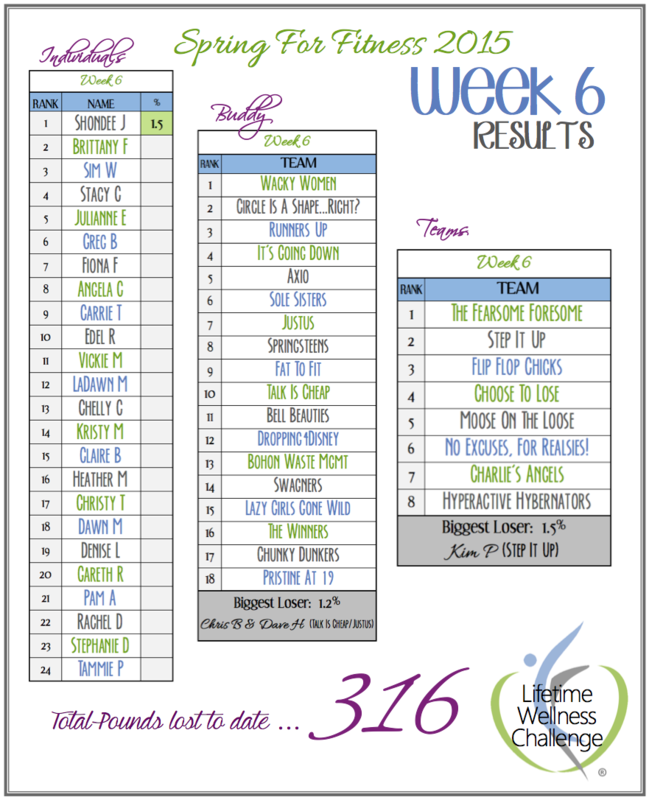 Congratulations to all our “losers” this week! This weekend one of our Individual Challengers posted on the Facebook Individual Support Page some of the positive things she has been experiencing since having started the New Year, New You Challenge. It certainly made my day and want to share her successes with you as well. I was thinking about all the good things that have happened since I started this challenge and I would like to share a few. 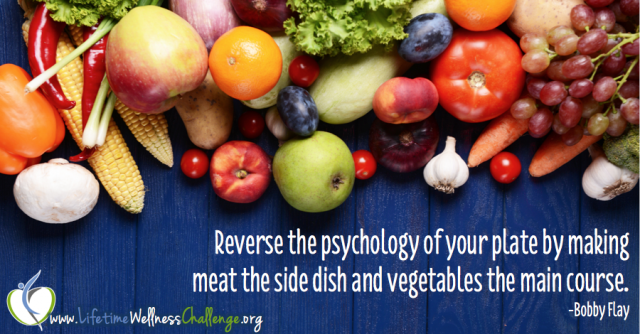 The 6th week of a challenge can be an interesting time of motivation or the lack of... In Week 1 and 2, everything is new, exciting and there are a lot of physical changes happening. You still feel the “fire” of your decision to live healthier. Since week 4 is a measure week, the extra indicator of success can offset any waning motivation and reviewing goals can help put things back into perspective. Week 6, however, is just past that point and can feel a little more difficult to sustain that “fire”. The habits you’ve been developing are become easier but it may not be as “exciting” as it once was. So, how do we keep going? 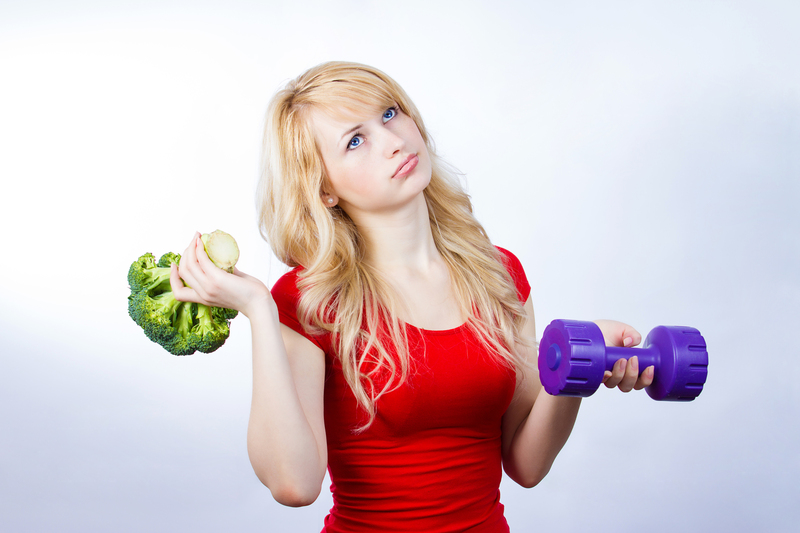 How do we continue to exercise, eat our veggies and not eat our weight in cookies when the “fire” seems missing? Thank you! This was a great article!! It is so fun to share Turkey Trot stories. Who cares if it's months past Thanksgiving, right? I think Jan A. 's story is one of love for her family and the spirit of determination for herself. Which makes this completely fitting this week. With that in mind, I'd like to share Jan A. 's experience. 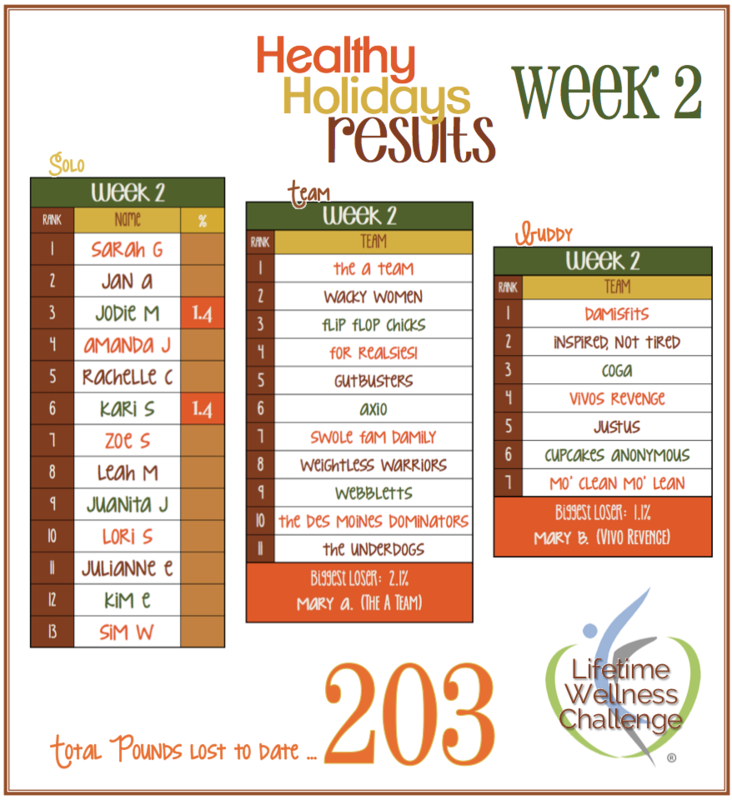 It was another great week for our New Year "New You" Challengers! So many of you are facing tough circumstances and yet, here you are making your HEALTH a priority. You make us so proud and you should be proud of yourself, too! Wherever you may be in your journey to improved health, don't wait to give kudos where kudos are due. Each effort, each mistake, each time you pick yourself up and make another attempt show's that you are TRYING and it should be recognized. I have been so impressed with Lori T and her positive attitude since she started competing in the 2014 Holiday Challenge. One of the weekly bonuses during that Challenge was to complete a 5K Turkey Trot (3.1 miles) over the week of Thanksgiving. It was not a requirement to participate in a local event, but to get out there and finish the distance however you could at your level of fitness. Lori chose to use a DVD to complete it. I hadn’t thought of that! Way to get creative, Lori! Change is not easy. If it was, we would all be able to do it and we wouldn't need the support of others or additional accountibility to make it happen. I believe it's best to approach any change with realistic, but hopeful expectations of what you're up against as you work to acheive your goals. It won't be easy, but it's not impossible either. Take any obstacles you face in stride, with a positive outlook and see what unfolds for you. I don't think you'll be disappointed. I always appreciate everything you post! Change is VERY hard and I thank you for the motivation and support! 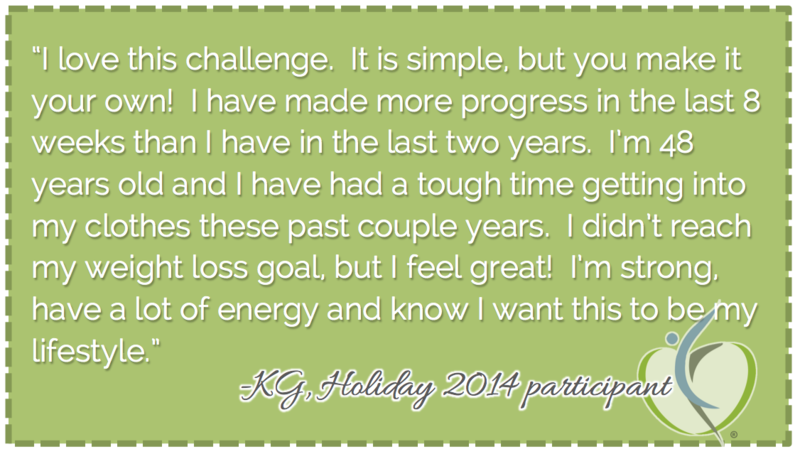 I was blown away by all of the New Year Challenge participants this week! You are on FIRE!!! You are not just losing weight, which many are doing in a big way, but you are developing habits that will serve you well throughout your life. THAT, my friends, is worth applauding!! Now, let's look at the lineups for WEEK 1... Be sure to check out our biggest losers AND our combined weight loss, 220 lbs, in just the first week. That' is amazing. Absolutely amazing. 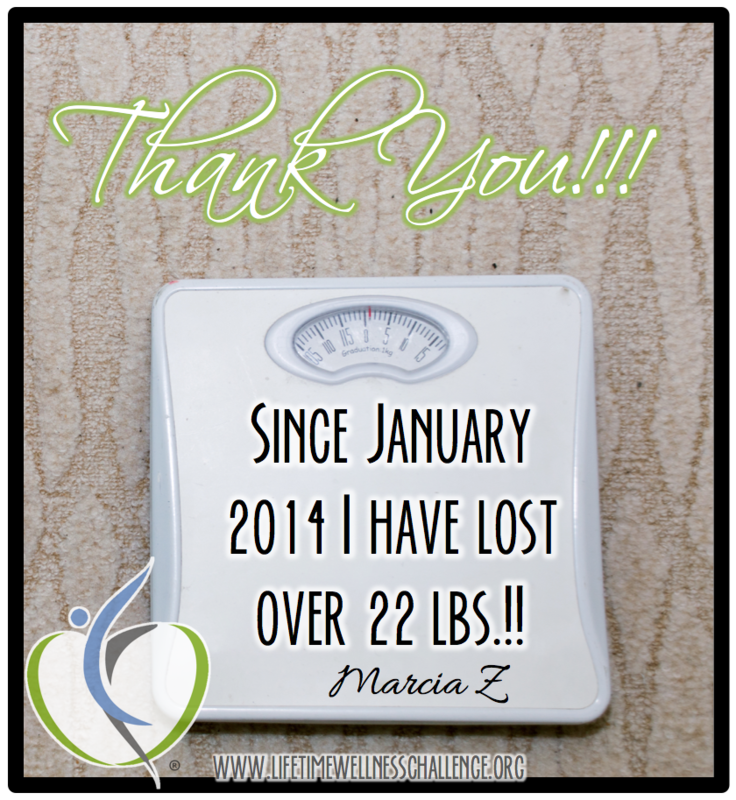 Camille D. shared this success with us recently and I just LOVED it! Her story shows her dedication to improving her health and her ability to make that process more important than what others may think. 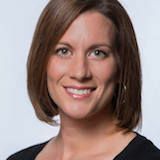 All too often women (and men) can get sucked into the false belief that their worth is determined by the size of their pants, a number on the scale, the size of their muscles or how fast they can run. Media bombards us with images that perpetuate that lie. Here's the reality, my friends. You are of worth no matter what. You are of worth if you are overweight, underweight, tall, short, shaped like an apple, pear or whatever strange comparison is out there. You are of worth because you are YOU! And your level of worth isn't changed by the mistakes you've made or the wonderful things you've done in your life. You are of worth because you are! So, let's all stop waiting for "skinny" to make us happy, content and at peace with ourselves. Let's focus on loving ourselves for who we are, the good, the bad and the ever striving nature we possess. Thank You !!!!! I love this thought. 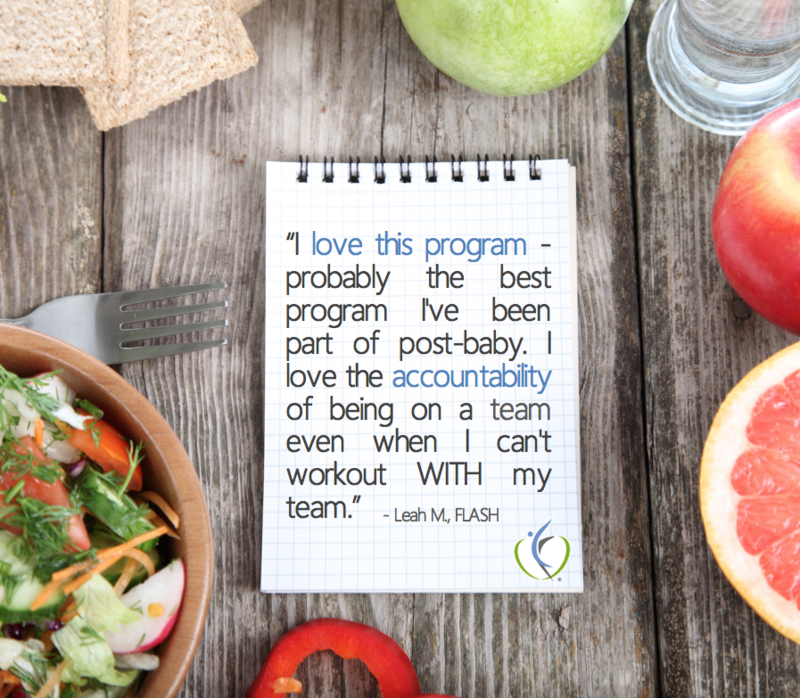 I can't help but get excited when I read the successes we hear from participants! Sure, it's fun to hear about someone losing X amount of pounds, but it's REALLY amazing to read the little differences a few changes can make. Today is a new day. Get up. Stand tall and be your best self! This is your life. Live it to the fullest without regret. What a great saying. Everyday holds so much potential. It's a fresh slate. Overcoming nerves and completing a 5-mile Turkey Trot! When you read Holly's Turkey Trot experience you'll understand just how dedicated she was to finishing her first 5-mile race! Read on, friends, read on..."
I ran the 5-mile Turkey Trot this year in Marshfield, WI. I was very nervous to say the least. I have run several 5K races before and also run/walked a 10k a few years ago, but this was my first attempt at running a 5-mile race. I made my husband come with me, because I had only run that distance one other time before and was a little light headed afterwards and the drive home was a half hour. 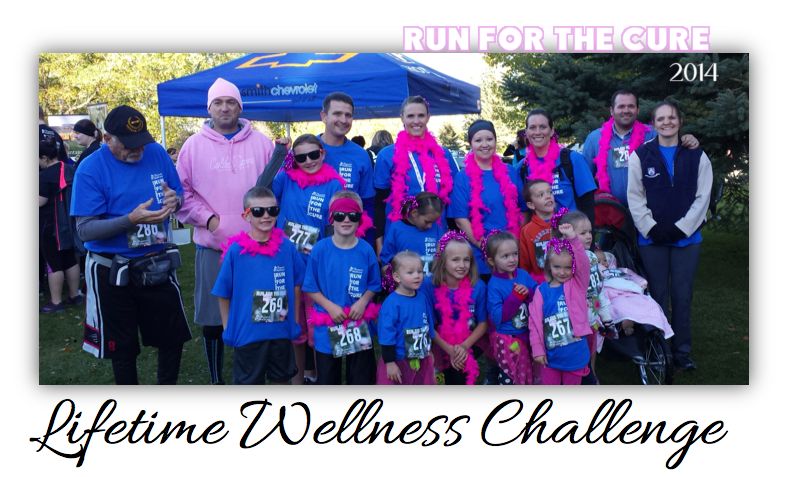 The race started at 8am and the temperature was in the single digits with below zero wind chills. The sun was actually shining and I actually stayed warm…with the exception of my toes. I have tried every combination of socks and cannot seem to keep my feet warm. I think I am going to have to buy some winter running shoes. Anyway, the race went really well. The first mile always drags, the second flew by. There was a water station at the half way mark. To my surprise when I tossed back my cup of water was a huge chunk of ice. It was so cold the cups of water were freezing. I am so used to the lukewarm water of the summer I almost choked on a chunk of ice! Mile 3 is always the longest for me. I think it is because my body/mind is used to stopping at the 5k mark and is trying to figure out why we are still moving. By the time I hit the 4-mile mark I was ready to go again. I took of my cowl at that point because I was overheating and kicked it into high gear and headed for the end. Actually pacing fast mile of all 5. My goal was to run it in an hour and I completed it in just over 58 minutes. So I was extremely happy. Especially when I look back at when I first started my first challenge in May and my first fitness test I was pacing over a 15-minute mile. The cold temps didn’t set in until we go to the car and my body started cooling down. I spent the rest of the day trying to warm up. Awesome! Way to go, Holly! -Kirsti D.
Holly is amazing in so many ways! She has been a true inspiration to our team! So proud of you, Holly! I noticed that many of you are struggling to balance the upcoming holiday and your health goals. Believe me, I understand!! I'm having a hard time, too. All the holiday prep can feel overwhelming. The travel, the shopping, the CLEANING, the baking, getting caught up at work, the recitals and the list just keeps getting longer...everyday! Here's the thing though, you will be so much better prepared to take on all of those tasks if you put YOU on the priority list. Just think of the possibilities if you were to take 30 -45 min. each morning to exercise and plan out your day. It could literally be the difference of feeling "on top of it all" and getting near the bottom of that "To Do" list and feeling like you're "chasing the bus" all day, leaving you in frustration and STRESS. We all know what stress leads to, right? 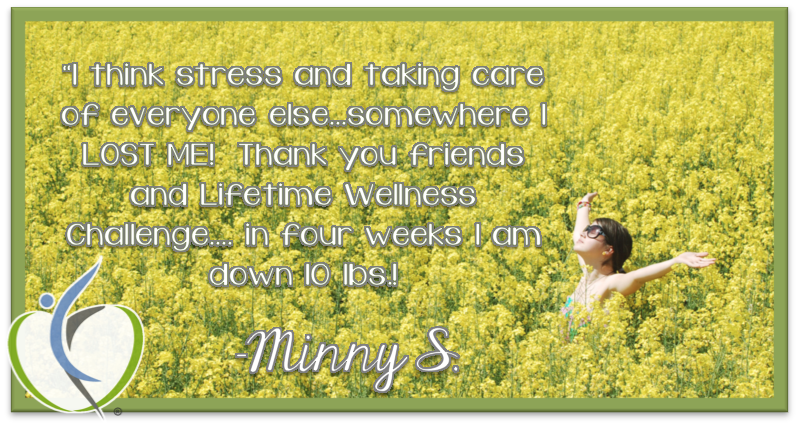 For many of us.... stress eating, stress weight gain, stress sluggishness, stress frustration and more. Let's decide NOW to evaluate our PRIORITIES and make sure that we are ON THE TOP OF THE LIST! I love Thanksgiving time. It is a great time to refocus on remembering to be grateful for everything we have. 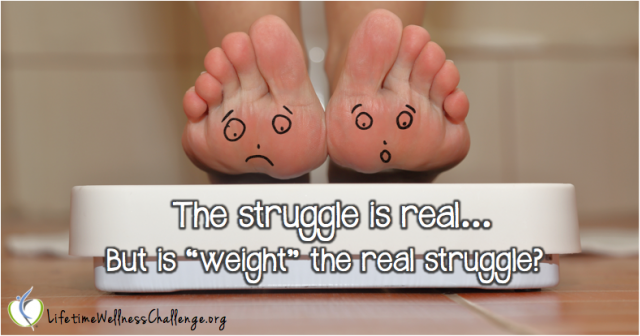 This is what this fitness challenge is all about people! Is it great to lose weight? Of course! But let's not forget how very important it is to improve your overall health. That includes your emotional health as well. In fact, I believe that our emotional health is directly related to our physical health. The two work hand in hand. If you don't take care of yourself physically, your emotional health will suffer. If you don't take care of yourself emotionally, your physical health suffers. Thank you, Kristy, for reminding us what is truly important! Every one is a dreamer. We dream about all kinds of things night and day. We may dream at night but we can also "dream" or imagine what we will make for dinner, how we will deal with our cranky toddler during a meltdown (or co-worker...you fill in the blank), what we’ll do for exercise that day or even what we want for our future. What I want to talk about today is imagery. You may hear it called by different names, visualization, dreaming, meditation, positive thinking, etc., but the idea is the same. Imagery allows us to create an experience before actually “experiencing” it. We can actually “see” ourselves performing a workout before we even change into our running shoes. What an incredible ability we possess!! The most amazing thing about this ability is that when we “dream” or “imagine” we can actually have an impact on our ability to physically carry out whatever we imagine. 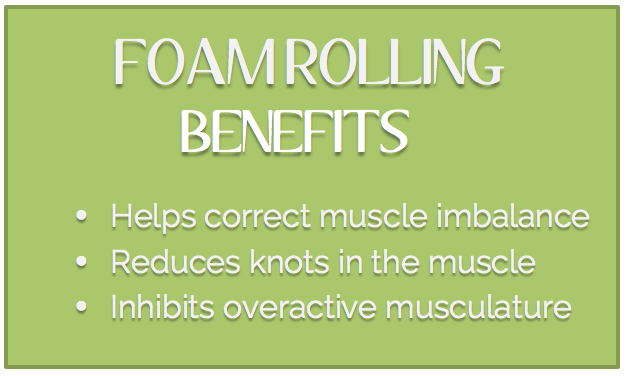 This type of visualization has been shown to help in managing pain and discomfort, improving positive outcomes for situations and even relieving stress through relaxation. Ready to learn how to use this skill to your benefit? First, get out your pen and paper. 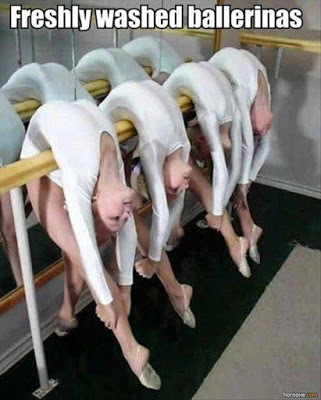 I know, you’re supposed to be imagining, right? Work with me here, I promise it will help in a minute. Okay, all set? Now you can think. Ask yourself if there was ever a time in your past that you had a positive experience with exercise. Maybe you ran a really fast mile and felt really proud or just felt great after a hard workout or...something along those lines. I think that's a terrific idea! Try it out and let us know if it helped. Keep trying! You'll get there. Hold onto that positivity!! You CAN do this! This is an exciting week because Monday marked the end of the September Challenge. Which means.... I get to announce the WINNERS!! YAY!! I'm really proud of all of our September competitors! Many of you had struggles along the way and you just kept plugging along doing your best despite your circumstances. That's the true test of your commitment to a healthy YOU! Thank you for being such amazing examples to us and to others!! “When I first started this particular challenge, I doubted myself about reaching a weight I haven't seen on the scale in many years. I'm a 56-year-old grandma and have had life struggles just like everyone else. Can you think of others reasons why people might choose to change? I think those are both good thoughts. It might go with the others, but I really like that thought! Thanks for sharing. Best Fitness Challenge Weekly WINNERS! September Buddies & Individuals are getting close to the end, so NOW is the time that you might be tempted to slack off and say...'Well. I'll just try again next time', but DON'T let yourself go there!! Now is the time that you really learn what you're made of. Are you going to let your ranking get in the way of your personal goal?!? Heck No! Finish this out STRONG and know that whether or not you win this round of LWC, you will be able to take pride in the fact that you did NOT give up! Thanks for sharing your success. You are awesome! "If anybody would have asked me at anytime in my life if I would become a runner, or at least someone who chooses to run, I would've laughed and told them not a chance. But that has changed now and I just completed my first 5k. I'm still slightly shocked that I did it. But more than that, I'm proud. I'm proud of this small accomplishment that, to me, has become a huge turning point in my life. Five years ago, I was about 6-7 months pregnant with my first son. I have since had two more. Yep, three boys in less than five years. Heaven help me! And while I have loved my journey of becoming a mom and raising my boys, there have been plenty of bumps along the way. The two biggest (for me personally) have been my battle with depression and my physical appearance, meaning weight gain. Those two put together make for not a very happy mom/wife. Don't get me wrong; I've had many happy moments and so many great memories being made with my children and husband. Just deep down inside, there's always been a hollow feeling that I know I'm not completely happy with my seemingly happy life. Through so many blessings, I've still found myself upset. When my last baby was born (in June of this year), I finally accepted the realization that I NEEDED to do something about my weight. 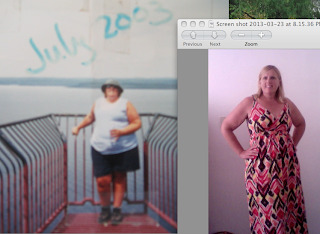 Through being pregnant and giving birth three times so close together, I had gained over 50lbs from where I used to be. I knew that was part of the main reason my depression had been worse as well. Not only did I have very low self-esteem, I was tired and exhausted all the time. I just didn’t feel good. 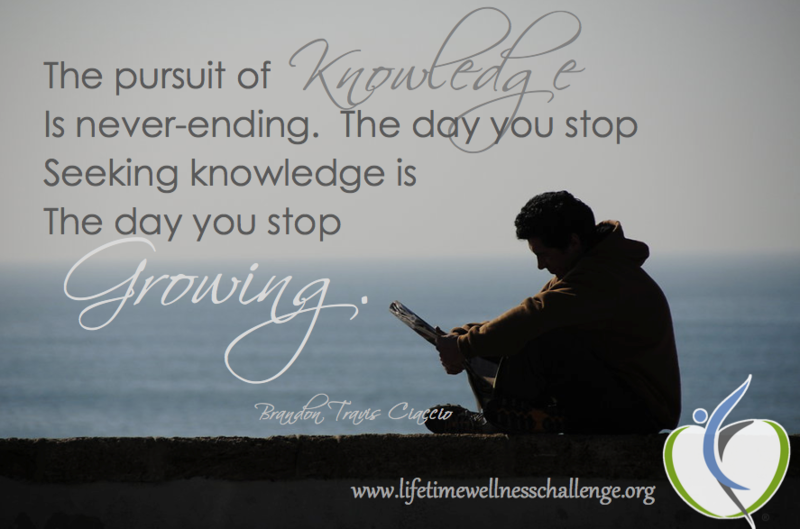 I knew that in order to take care of my kids, my husband, the house, and myself, I could not continue living the way I was. Something big had to change. After an emotional heart to heart conversation with my husband (who has been SO loving and SO supportive of me through everything), I decided to get a gym membership. The journey of health is long. It can be difficult. It can be discouraging, but there's hope! It will get better! You WILL be stronger mentally and physically. Don't let a setback stop you from picking up and trying again! You are capable of FAR more than you know. Get out there and find your greatness! This is absolutely true! We have to create the life we want or our life will be created for us and I'm pretty sure we're not going to love the outcome. Let's be proactive and make it great! Have we mentioned lately just how much we LOVE hearing about how well you have done!?! It's not just exciting for you, it's incredibly exciting for us as well!! When Greg let us know last week that he'd been able to stay at least 20 lbs below his initial weight since beginning, we were reminded again why we continue to host these challenges. YOU INSPIRE US! You may think it is the other way around sometimes, but not so! As you know, Valerie and I still have our own struggles that we continue to work through every single day. Mary B. has gained Strength, Endurance & Energy! It's funny how easy it can be to get sucked into the "scale zone". It's that zone where nothing matters but what the scale tells you and then you get all depressed because it didn't tell you exactly what you wanted to hear, when you wanted to hear it. I'm a big advocate of monitoring weight in order to keep us honest and give us a general idea of what's happening with our health, but overall, the scale just can't tell you how many inches you've lost, how energetic you feel or the comfort level of your pants! I'm always happy when our participants recognize these things!! Here's what Kristy M. shared a couple of weeks ago. Paula GI needed that today. Thanks. Choose a mantra for the difficult times and repeat it over and over until you just can't help but believe that you are capable of accomplishing ALL that you set out to do! We believe in you and it's time that YOU believe in you, too. I so believe in this. No negative thoughts!